The Main Bike Path is shown in red above. The alternate route shown in green can be used during periods of high water on Linn Creek. 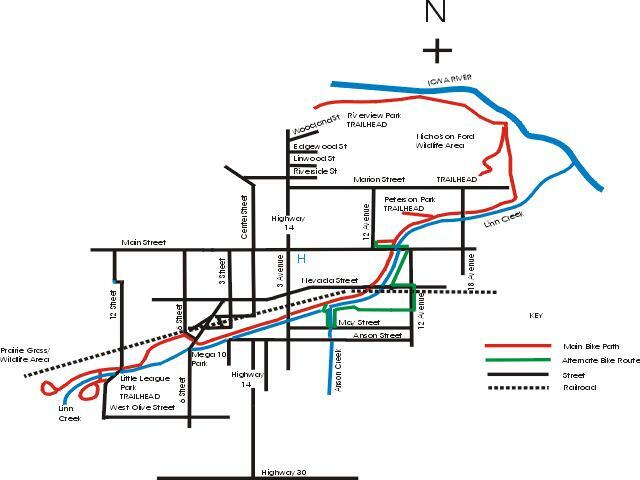 The alternate route requires crossing the Union Pacific railroad, and crossing several busy intersections. Almost all of the trail was re-surfaced in summer the of 2000 and early 2001.The only section not re-surfaced is a short segment near the YMCA.This segment may be a little rough for rollerbladers.